A search and rescue winchman from Cornwall has been presented with a Queen's Gallantry Award at Buckingham Palace. 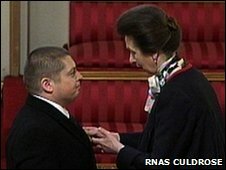 Chief Petty Officer Dave Rigg from 771 squadron at RNAS Culdrose was given the award by HRH The Princess Royal for his part in a dramatic rescue in 2008. The crew was scrambled when a Spanish fisherman was fatally injured on a boat 150 miles off the Isles of Scilly. They battled with gale force winds and rough seas to reach and winch the man. 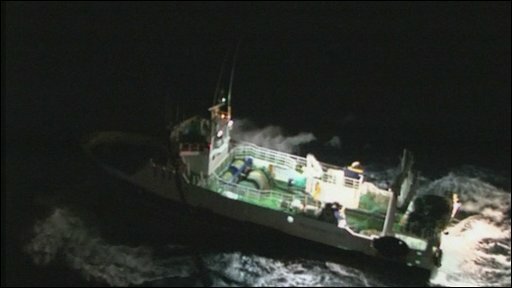 The crew of Rescue 193 was scrambled by Falmouth Coastguard just before midnight on 10 November 2008. The fisherman had severe abdominal lacerations. He was injured when a high tension cable snapped and ripped into his stomach. The vessel, "Pesca Verdes Tres", was 150 nautical miles south west of the Isles of Scilly in a westerly gale force 8 wind and rough seas. The fishing boat was pitching by about 45ft (14m) in the heavy south-westerly swell. It took 30 minutes and several attempts to land CPO Rigg on the deck. The boat was so far off land that the helicopter crew risked running out of fuel before they made it back to base. CPO Rigg said: "I think by the time I'd got on board, assessed the casualty, packaged him up, got him to the upper deck and then got him clear of the boat we had about ten minutes left before the aircraft would have to turn around and disappear." The fisherman was given CPR four times on the way to the Royal Cornwall Hospital, but died from his injuries before Rescue 193 made it back to land. In October 2009 the whole crew received the Prince Philip Helicopter Rescue Award for displaying "outstanding courage and devotion to duty". It was presented by the Guild of Air Pilots and Air Navigators (GAPAN).